hat are the criteria for a good piano? Pierre Malbos : First and foremost, you have to determine your budget. Then, you can choose your piano based on the quality of its make, your own personal preference for a certain sound or feel, and the visual aspect of the piano as a piece of furniture can also be taken into account. You also need to think about how much space you have at home: would a grand piano fit? And what do you want to do with it: are you looking for a starter piano? How should I choose where to buy my piano? I would say that it's best to choose a store which provides repair services. Aside from this, most stores sell more or less the same pianos. Factory standards are much better than they were in the past, so pianos today are properly regulated. There isn't a big difference from one seller to the next in terms of the pianos themselves. It's more piano maintenance and customer service which will be decisive. Can the buyer ask for certain modifications to be made on the piano before it's delivered? Yes, you can request certain modifications. But you should be careful about this... It's better to choose a piano that matches what you're looking for, rather than try to imagine what it will sound like after the modifications proposed by the salesman: "It's true, it's not perfect now, but you'll see, after a bit of work once it's at your place, it will be like night and day!" It should match your specifications when you buy it, knowing that it can be worked on later to improve it. Is it a good idea to visit several salesrooms? If you're buying a piano for the first time and don't really know how to go about it, it's definitely a good idea to visit several different stores, if for nothing else but to see what the role of a piano salesperson is and how they do their work. Some people sell pianos as if they were selling washing machines! Others really know how to sell an instrument that will make music... This way you'll also be able to try many different pianos, to get an idea of how they're different. Not all stores sell the same brands or the same models. Once you've determined your budget, it's a good idea to try everything within that budget so that you can choose based on what you prefer. If you're looking to buy a piano to replace an old one, the situation is different. In that case, you can simply go back to the store where you bought the first if you were satisfied. I think it's best, if possible, to maintain a long-term relationship with a given store. What's the best way to choose a brand? There's an economic aspect – how much the piano will depreciate if you want to resell it – which is often tied to the quality of the make. It's important to look into the used piano market; talk to professionals, pianists, piano makers. You can choose the brand based on its reliability over time and its depreciation rate. How can I judge the quality of the make? In France, we have a system where famous pianists and big names in the music world test different makes of piano and then draw up a ranking based on different criteria (the banc d'essai system). This is useful, in that it gives a snapshot of what's out there on the market, which helps clarify some things for someone unfamiliar with this terrain. The one drawback is that only new pianos are evaluated in this system. It's impossible to tell how these pianos will hold up after years of regular playing. When you're buying a piano and you've narrowed down your choices, don't hesitate to call on a professional. There are two kinds of professionals who could provide an opinion: a piano builder for the technical aspects, and a pianist or piano teacher for the musical aspects. People often ask their piano teacher to give a technical opinion, even though they're not trained for this. It's best to contact an independent technician. Is there separate category of instruments for different levels of pianists? You could indeed divide pianos into several categories. For example, there are pianos intended for beginners, mainly upright pianos generally, for a budget between 2,500 and 5,000 euros. But it's also possible to start on a more expensive piano if you so please and if you have the means to do so. The notion of pleasure is essential – we often speak only of the mechanics. The mechanics of a piano are of course very important, but the musical and acoustical elements are just as important. What are the traps to avoid? You should be wary of sales pitches like: "I'll throw in ten tunings for free." That's not worth anything in my mind. A free tuning is simply someone who will come to your house for 15 minutes and won't do anything at all. It's better to pay for tunings yourself. In addition, you have to be sure that the piano you tried and chose at the store is indeed the one they deliver. I would advise that you write down the model and the serial number, and that you specifically tell the salesperson that you want that piano and not another piano of the same model. Can we trust Chinese-made pianos? I don't know enough about them, because I'm rarely in contact with them. But I have noticed that Chinese-made pianos are of much higher quality than the pianos made in Eastern Europe twenty or thirty years ago. I also know that European and Japanese piano makers have all signed joint-ventures with Chinese companies [agreements between European/Japanese and Chinese manufacturers which include technology transfers, ed.] or off-shored production in part to China. The Chinese thus have experience with European and Japanese piano manufacturing. However, these instruments' reliability over time and their resale price remain to be seen. That can be a useful tool. The silence system on Yamaha grands is very effective. I'm less enthused about those on uprights. These systems, and the regulations they require, do change the action on acoustic pianos. I've come to realize that, overall, people aren't really satisfied with these systems. They don't end up with the acoustic piano that they would have liked. Why not buy an acoustic piano and an electronic keyboard for times when a silent piano is necessary? Does it work well to put a silence system on a piano that wasn't made with one? I would advise against that. If the piano wasn't designed for a silence system, it rarely works to add one after the fact. You end up completely modifying the instrument and people end up with a piano that doesn't resemble the acoustic piano they started out with. There are two different kinds of used pianos. On the one hand, you have lightly-used pianos that are nearly new. On the other hand, you have old pianos, which can be good for people who want a specific sound, being aware that the action on old pianos doesn't work quite as well as that of modern pianos. But beware of hidden problems! In this case again, a professional opinion is essential. What are the risks associated with buying a used piano from an individual? What should I do to have good acoustics in my piano room? Tiling and concrete floors should be avoided – hardwood is better. The walls should not be bare, and an empty room is not advisable either. That said, avoid having too many draperies and rugs, so as not to muffle the sound. Let's speak about maintenance now: what is involved? 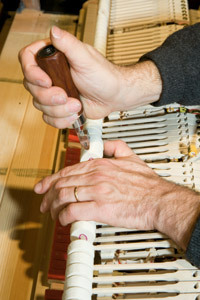 Maintaining a piano consists of several steps. First of all, there's tuning, which is simply tightening the strings so that each string of each note is tuned to the proper frequency. This is done based on a given reference point, either 440 Hertz or 442 Hertz [frequency of the 'A' found in the middle of the treble clef, Ed.]. That's key. There are two steps to tuning a piano: first one has to find a balance between the notes, between the intervals of a fifth, fourth, etc. We start by tuning an octave in the middle of the piano, which we divide into equal half-steps – this is called the temperament octave. Using this octave, we tune the rest of the piano, the bass and the treble, checking the overall tuning and making sure the sound is homogenous. That's the musical part. Then we work on the tone, the sound, which has musical aspects as well, but which directly concerns individual notes. There are three strings per note. These three strings must be tuned to the same frequency. However, we have some leeway when we tune these three strings – we can make the sound open up or close. We can get a sterile sound, a sad sound, or on the contrary a much more open, colorful, luminous sound with more harmonics and better sound projection. It's thus up to the tuner, according to his or her experience and abilities, to adapt to each instrument in order to feel the right balance between a pitch-perfect tuning and a sound that has life to it. I believe that this is the most difficult aspect of tuning, but it's also the most interesting because it's on a case-by-case basis. Then, there's regulation, which needs to be done less frequently, but should be checked at each tuning to make sure that all the regulations points are properly in place. The last thing is voicing, which is an adjustment of the piano's tone or quality of sound. All of these elements tie into an overall vision of the instrument. Can you tell us a little more about regulation? Without going into too much detail about each step, it involves adjusting the keyboard and the action. For a pianist, their contact with the piano is through the key. He or she presses the key down, up to the point where this causes the hammer to strike the string. This process involves a chain of mechanical events which have to flow smoothly from one to the next. It's a kinetic chain. We have to make sure that the pianist can have full control over the key -- it's his or her only contact with the instrument – and thus fully realize his or her intention in the sound. There are about 15 regulation points, which you then multiply by 88 keys! Once an optimal regulation is found, we have to then reproduce that uniformly over the whole keyboard. Voicing defines the tone and the sound color of the instrument by working on the texture of the hammer felt so that each hammer strikes squarely all the strings of a given note [one or two strings in the lower register, three strings per note on the rest of the keyboard, ed.]. Obtaining a homogenous sound over the whole keyboard, also known as equalization, consists of making sure that some notes aren't brighter or more muffled than the rest. The goal is to have the same sound color for every note, bearing in mind that we also want a full sound that projects, rather than a dull sound that dies out immediately after it's played. This goal cannot be met in one work session; it takes place over the long-term, with many little tweaks in several different steps. The first step is what we call needling. Then we have to let the felt rest and be played for a while before working on it again. The best voicing work takes place over a long period of time. One session of voicing will improve things, but the results will not last. Twice a year, minimum. But it depends on personal preference. It's not unusual for a professional to get his or her piano tuned every three months. That's good for the instrument – the more a piano is tuned, the better it is. Sometimes you have to tune a piano several times within a short period of time to stabilize it, especially if it hasn't been tuned for a long time and is much lower in pitch than it should be. ?What are the ideal conditions for a piano, in terms of temperature and humidity? What kind of budget is necessary for maintaining a new piano? For an upright, I would say between 200 and 500 euros per year, which includes two tunings and the monitoring of the regulation and voicing, for a piano which was optimally regulated when you bought it. For a grand, on average I would say between 300 and 1,000 euros. When you're drawing up your purchase budget, it's important to bear in mind maintenance costs as well. Is there anything in particular that needs to be done on a new piano? The key issue is regulation, that is to say the position of the hammer relative to the string and the way the hammers hit the strings. On a new piano, the felts are new and have no traces of hitting the strings on them. If the piano is not regulated immediately, you can play for six months or a year, and what will happen is these marks will be left in the wrong places on the felt. Then a lot of work will have to be done in order to sand the felts down to get rid of the marks and start again from zero. What changes in a piano over time? On a piano that gets played a lot, one has to maintain the mortises. The felt on the mortises gets worn quickly and must be replaced so that the keys in place and have no sideways slippage. The felt on the hammers also has to be looked at, as they bear the marks of repeatedly striking the strings, and this can wear the felt out by flattening or denting it. In this case, you need to regularly have the hammer felt sanded in order to keep it in good shape and to keep the strike point in the right place. This will determine the quality of the sound when the hammer strikes the string. Sanding the felt over time will eventually make it necessary to replace the felt, or even replace the hammers themselves. How can I find a good technician? That is rather difficult, as it's difficult for clients to judge the complex work of a technician. Word of mouth seems like a good solution. Rather than talking about what makes a good or bad tuner, I think it's better to think in terms of with whom the pianist can establish a long-term relationship. The technician should have a way of approaching the sound of a piano that corresponds to that of the pianist. Thus, each pianist can find a tuner who's right for him or her, without thinking about who is the best in absolute terms. The issue is not one of quality but rather of understanding. The idea of maintenance over the long term is essential in my mind. It's best to always call on the same person, so that he or she can build on the work he or she did previously in order to continually improve the piano. When a tuner works on a piano for the first time, he or she needs some time to get to know the instrument. The first tuning is rarely the best, because every tuner has his or her own way of working and set of gestures, his or her own way of turning the tuning lever, of adjusting the tuning, which makes it so the piano will react differently to different tuners. Once the piano gets used to a certain gesture, it will be much more stable. The tuner and the piano have to be on the same wavelength. 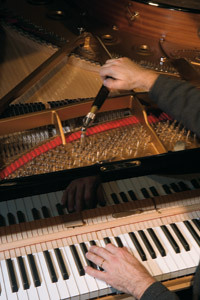 Piano tuner, voicer, restorer, and builder for over two decades, Pierre Malbos studied at the Institut Européen des Métiers de la Musique (ITEMM), then in Japan at the Yamaha Technical Academy, where he was the first European student. He set up shop on the outskirts of Paris, in Ivry-sur-Seine (post code 94): the F01 workshop, for instrument building, and the 4'33'' recording studio. He specializes in concert pianos, and he is on a perpetual quest for "optimal sound material." "It's more than just making a sound, it must also touch people", he says. In this vein, he adapts the tuning and regulation of instruments depending on the acoustics, the pianist, and the repertoire. In order to be as close as possible to his pianos and to provide pianists with this "excellence in sound," he acquired two concert grands which he rents: a Yamaha CFIIIS and a Steinway D-274, which he chose personally at the Steinway manufacturer in Hamburg. For the latter, he built two different keyboards and two different mechanisms, which have very different characters. Pierre Malbos is unanimously recognized as a guiding light in the music world. He thus often works on the concert stage, in festivals or for recordings with artists such as N. Angelich, H. Grimaud, N. Luganski, and G. Sokolov, to name a few. He also teaches at the ITEMM and gives lectures on instrument building. In order to use musically the sound material he explores from a technical point of view, he occasionally sheds his tuner identity to go back to his original role as musician. He composes electroacoustic music at the GRM, (Groupe de Recherches Musicales). France Musique recently broadcast one of his pieces, Astrocytes. In addition, his love for contemporary music inspires him to welcome musicians who wish to prepare their 20th century music concerts in his workshop. As an instrument builder, he worked with the Baschet brothers, the creators of Sculptures Sonores, on a piano which bears the name of the Baschet-Malbos Piano, honored in 2004 with the SEMA Prize for Artistic Trades. 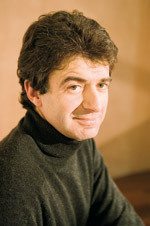 His work with Bernard and François Baschet has further enriched his sound palette. Whether as a tuner, composer, builder, or teacher, Pierre Malbos' primary interest remains the search for and the creation of sound.